My gardening philosophy, if I have one, is of the pasta-pot variety: Throw it against the wall and see if it sticks. (This is not to be confused with seed bombing, which in my opinion is much more charming and probably more effective than what I do.) But in my bit of Arcadia, with its heavy, sticky clay, absurd summer heat and humidity, unpredictable water, and nutrient-sucking oak trees, I have been reduced to nine years of trial and error. 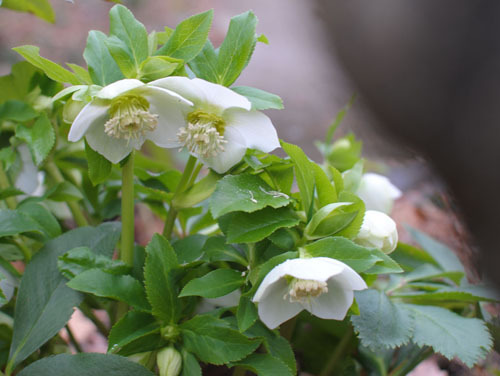 Flowers of Helleborus orientalis bloom in winter and early spring, and are deer-proof. Helleborus orientalis: Passed along by my neighbor, these lovelies bloom when little else does (right now! ), persevere under impossible conditions, require virtually nothing in theway of attention from me, and have bold evergreen foliage. They reseed generously but are not at all difficult to manage. I have successfully transplanted tiny seedlings by sticking my finger into the dirt, shoving the plant in, and walking away. I don’t even water them in. I will never willingly be without these plants again. Gardenia jasminoides. I have a hedge of these that I planted in 2004 as quart-sized shrublets. Today, they’re well over 5′ tall and flower gorgeously in May and June, when they perfume the entire garden. Their foliage is glossy, their flowers voluptuous, and so far, I’ve not had any problems with insects or disease. Sometimes, if I’ve pruned intelligently, I can get a second flush of bloom in late August. 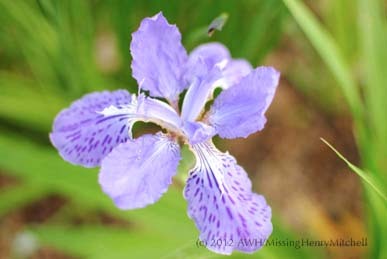 The bloom of Iris tectorum, Japanese roof iris. 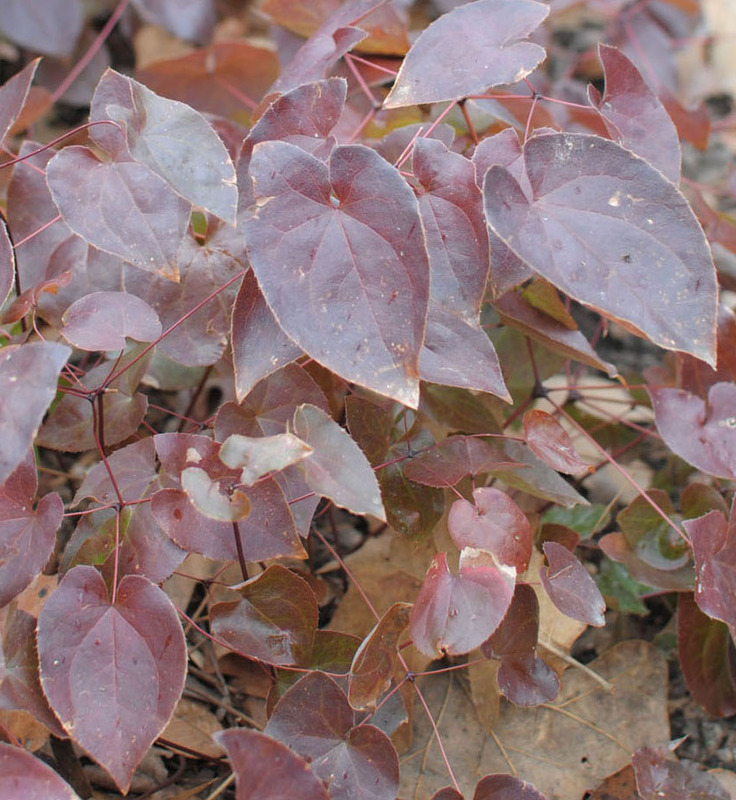 Epimedium x versicolor ‘Sulphureum.‘ Delicate-looking, but absolutely tough as nails (perhaps you are detecting a pattern in my affections by now). Its heart-shaped leaves are evergreen here, though they turn a rusty bronze in winter. It blooms for me for several weeks in spring, with dainty yellow flowers dangling on a wiry stem. I have a clump about 3′ in diameter sitting smack on top of the roots of an oak, and it never complains or looks puny. 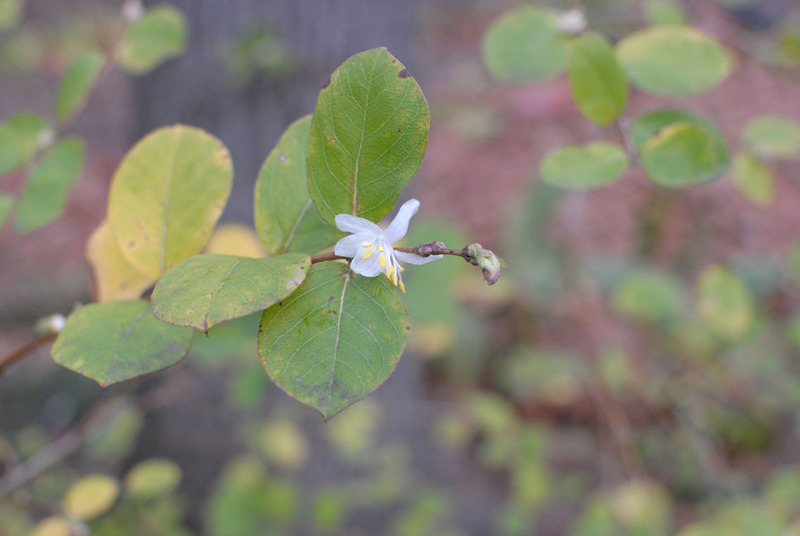 The blossoms of winter honeysuckle, Lonicera fragrantissima, are lemon-scented. Lonicera fragrantissima. Fragrant winter honeysuckle grows as a large shrub or small tree. Mine copes happily with hot afternoon sun between (you guessed it) two large oaks, and smells heavenly when it blooms in late February or March (though with all the warm weather we’ve had lately, mine started blooming last week). I admit it looks a bit worn at the moment, but it’s suffered a bit of neglect this fall. In the spring after a light dressing of compost, it will fill out marvelously with abundant, rich green leaves. It would probably be even more glorious if I gave it a more sympathetic home, but it does what I ask of it, and earns my admiration in return. This entry was posted in 2013, Backyard Blooms, Communing with Nature, Garden plants, Gardening Basics, Ground covers, Ornamental Plants, Perennial plants, Shrubs and tagged easy plants for beginning gardeners, epimedium, gardenias, gardening, hellebores, iris, lonicera, plants, winter sowing by missinghenrymitchell. Bookmark the permalink.